Tragedy tore Christopher’s world apart. But Emily believes there are enough pieces left behind to stitch together a beautiful new beginning. Emily Fisher is eager to meet the new employee at her father’s shop in Bird-in-Hand, Pennsylvania. But when Christopher Hochstetler arrives, his cold demeanor freezes her attempts at building a friendship. Longing for a fresh start, Christopher travels from Ohio to Bird-in-Hand to work at his uncle’s shop. Christopher’s heart is still wounded from memories of home, and making new friends is the last thing on his mind—he knows the pain that comes with losing those you love. When Emily is kind to him, he tries to remain distant, but he soon finds himself stealing glances at her throughout the day. When Christopher shares his tragic reasons for leaving home, Emily decides to make a quilt for him as a gesture of their friendship. Even though he is not a member of the church, she’s found someone with whom she can imagine a future. The two are quickly falling in love when a family emergency calls Christopher back to Ohio without warning. "The Cherished Quilt" is the 3rd book in Amy Clipston's Amish Heirloom series and it is another sweet story that is easy to become lost in. Chris leaves home carrying a huge burden on his shoulders as tragedy has hit his family and he has guilt and pain. Chris carries this along with him to his new life in Bird-in-Hand and he cannot hide this from Emily, whom is curious about this new man working in her father's shop. Emily shows friendship and kindness and she and Chris ease into a friendship and Chris begins to share his story with her. Emily has an idea of how she can help him, but she also finds herself falling in love with Chris. However, Chris is still now sharing everything and when he must return home suddenly, Emily wonders if she will ever see him again. This is a quick, easy read that will draw you into the readers' lives. Emily is such a sweet girl and she is easy to like. Chris is hurting so deeply and it was so easy to like him and to empathize with him as he is on this journey of healing and starting a new life. While this is the third book in the series, it can be read as a stand-alone, but it is would be nice to read the first two if you have the chance as some of the characters are mentioned from the previous ones. This is a wonderful book to read through and ponder. "Waiting for Wonder" tells the story of Sarah and Abraham and the many years they waited for God to bless them with a child; they were blessed and it was on God's timeline. Everything is perfect in God's time, but that doesn't mean the waiting is always easy or in reality ever easy. I love how this book is set up as it really delves into Sarah's journey, but also ties in Marlo's personal journey as well, all the time encouraging the reader and gently reminding that we are all on the journey of life together, while we may be on different paths, we are all on the journey. This book flows nicely and is a great reminder this time of year while the new year is coming up and goals are set and can be met, but with God's help and on His timeline. *Thanks to Litfuse Publicity Group for including me on this blog tour and for the complimentary copy of this book. How would our community change if instead of absently saying, "I'll pray for you," we actually did pray---deeply, intensely, and purposefully? With compassion and encouragement, Amelia Rhodes offers Bible verses and prayer prompts, organized topically for every letter of the alphabet. There are five topics per letter---three prayers of petition asking God to work in a certain area of need, and two more prayers of praise to reflect gratitude for God's presence in the daily issues and relationships of life. Through petition and praise, your specific, focused communion with God will lighten your heart as you place the heaviness of those prayer requests where they belong---on His strong shoulders. Whether you are praying for a friend's adoption journey, a neighbor's bankruptcy, or a family member's cancer, this book will give you Bible verses, prayer prompts, and prayer starts to guide you through praying for even the most difficult issues that affect the people you know and love. Perfect for either individual or group prayer, Pray A to Z will help you experience the peace that comes from communicating with God. "Pray A to Z: a practical guide to pray for your community" is truly that - a book that will help guide your prayers. Sometimes it is hard to actually put into words what is on our hearts and minds, hard to voice what we are seeking God's help and guidance with. This is when Amelia's book comes in to help us to put into words what we are trying to pray for. This is a very "user-friendly" book as well as the topics are arranged alphabetically so it is easy to look through and find guidance on a specific thing you are facing and dealing with such as looking for employment, a loved one in the military and financial matters. Each topic has a page devoted to it including a verse or short passage, specific things in relation to the topic to think about and pray for and lastly, a sample, guided prayer to use. This is a must-have book for those whom are wishing to make a difference in their prayer lives and through their prayers. *Thanks to the Litfuse Publicity Group for including me on this blog tour and for the complimentary copy of this book. A tale of troubled love and honorable intentions gone awry—don't miss Michèle Phoenix's new intimate and bold release, Of Stillness and Storm. It took Lauren and her husband ten years to achieve their dream—reaching primitive tribes in remote regions of Nepal. When a friend from Lauren’s past enters her life again, the tension of coping with the present while reengaging with the past might be too much. Will it be the family's undoing? Take Michèle's new book with you on your winter vacation and enter to win her Bookworm On-the-Go Prize Pack (because you can't take a stack of books with you when you travel). Enter today by clicking the icon below, but hurry! The giveaway ends on December 31. The winner will be announced January 3 on Michèle's blog. "I felt torn between two worlds. Each with its own mystery. One more captivating than the other, but the other more real and breathing." It took Lauren and her husband ten years to achieve their dream---reaching primitive tribes in remote regions of Nepal. But while Sam treks into the Himalayas for weeks at a time, finding passion and purpose in his work among the needy, Lauren and Ryan stay behind, their daily reality more taxing than inspiring. For them, what started as a calling begins to feel like the family's undoing. At the peak of her isolation and disillusion, a friend from Lauren's past enters her life again. But as her communication with Aidan intensifies, so does the tension of coping with the present while reengaging with the past. It's thirteen-year-old Ryan who most keenly bears the brunt of her distraction. "Of Stillness and Storm" is a completely engaging, emotional and though-provoking read that will leave you thinking about it long after you finish reading the last page. Michele writes in such a way that it is so easy to became wrapped up in the story so that it feels as if the reader is a part of the story. Lauren is facing dilemmas in her life as she believed that she and her family were living their dream, but now she is questioning their choices and the path their lives are on. As Lauren struggles living her daily life and then a person from her past becomes a part of her life again, this adds another element to her inner conflict. Lauren was easy to relate to and empathize with and I liked how Michele made her so real and really brought out her emotions and thoughts. This was an emotional book to read as I found myself thinking about what I would do if I was in her place and found myself analyzing what Lauren was thinking and choosing. I highly recommend this book and am looking forward to reading more by this author in the future. Junie B. audiobook & music! My eight year-old daughter has read every since Junie B. Jones book, she is a huge fan! After listening to this cd, my six year-old son and myself are now fans of Junie as well! This is such a great audiobook, the voice is perfect for Junie and it is so entertaining to listen to. Junie B. is now a first-grader; however that doesn't mean that she has lost her sense of humor, or her straight-forward (and hilarious) way of talking! Junie B. is so relatable for kids and the books are entertaining, yet there are great lessons tied in as well. The music part of this is catchy and wonderful as well. I found myself laughing out loud at times and smiling throughout listening to this. I highly recommend this for any Junie B. Jones fan or for any child whom you would like to spark an interest and love for reading in. Are you in a season of waiting—waiting for an answer from God, waiting for a change? Be encouraged by Tanika Fitzgerald's new book, Miscarried Joy. Tanika transparently shares her deeply personal and disappointing experiences of losing her babies due to miscarriage. There were times when she felt God was the cause of her pain. Miscarried Joy has something for anyone who needs help pushing through incredible pain to conquer discouragement, walk in faith and birth their purpose. God’s delay in your life could be a set up for your greatest calling to be fulfilled. Conquer discouragement with the help of Miscarried Joy and enter to win Tanika's Hope Fulfilled Prize Pack. Enter today by clicking the icon below, but hurry! The giveaway ends on December 18. The winner will be announced December 19 on the Miscarried Joy blog. Tanika shares her heart, her heartbreak and her hope in this book and it is a sincere and thoughtful book that will resonate with women whom are struggling to trust God and trust His plan. Tanika had a plan and a dream, but this did not align with God's as she would have hoped. It can become so easy to become frustrated and turn away from God when we are filled with pain due to loss and pain because we feel as if God is not listening to our desires and dreams. This book is written in a way to encourage grieving, hurting women and to also help them to claim truths and promises from God's Word as women in Bible times had the same struggle as have many throughout the years. While I have not personally dealt with this exact loss, I know women whom have and I have faced others painful situations and I know how it can feel as if God is not really on my side and the struggle to remain close to Him and remember his promises. I highly recommend this book for those whom are struggling as this will be an encouragement. April Knight has created two amazing devotional books that are so much more than just a devotional. "ScriptureDoodle" and "ScriptureDoodle: God's Promises" each cover a 6-week period. Each devotion consists of a short reading, a verse or passage and then space to doodle, add to a design by following prompts and guided suggestions. These books are so enjoyable and relaxing while at the same time helping me to connect with God and His word. I found this to be just what I needed to force myself to really take that quiet time that is so necessary and to really escape into the word and allow myself to create and worship creatively, really coming from the heart. Letitia shares her heart and her own personal experiences with retreats in her book, "Getaway with God: the everywoman's guide to personal retreat." This book is divided into two main sections, the first discussing why the reader should take a personal retreat. The whys can vary from woman to woman, but ultimately Letitia stresses the point that is necessary for the well-being of the woman, personally, and also her family. The second section focuses on the actual getaway, the actual retreat and a schedule/plan for each day and also returning home at the end. I found this book a great read and a very through-provoking one as I read and pondered the thoughts that are shared in this book. I loved the layout and just overall style of this book as it is filled with quotes, lists, personal antidotes and questions to reflect on. This is a great read, especially one as the start of a new year is in a few weeks and this is a time for goal-setting and a time to make changes in our lives and how we live our lives. looking for an audio book to listen to? First of all, I want to say that I am not usually into audio books as my mind will wander and I just prefer to sit down and read an actual book. However, I do a lot of driving for my job and when I read the description of this book, I loved it and had to request it! I am so glad that I gave audio books another chance as this was a great book! I become completely wrapped up in the story and found it so easy to listen to and follow. Livvy is starting over in life, well basically she is running from the problems in her life as she does not know how to cope with them. Livvy ends up in her best friend's adorable Vermont town and she takes a job at the local Bed and Breakfast. I am a fan of Gilmore Girls and with the revival just recently out, I am still in the Stars Hallow and Dragonfly Inn mindset, so this book fit in nicely for me as it is the little charming New England town, with a little B&B, characters whom are enjoyable and can be related with and really just a place you would love to be at living and enjoying life. I felt like this book moved at a good pace and that it was so easy to become lost in the story and in the characters' lives as the descriptions were so vivid I felt as if I were a part of the story. I highly recommend this book as it is an enjoyable and memorable read/listen! new Christmas read from Debbie Mason! First of all, I absolutely love this gorgeous Christmas cover on Debbie Mason's new short Christmas read and the story inside is equally as cute and sweet! This is a fast-paced read that is about two characters whom readers have met previously in Debbie's books and whom have a past with each other. Michael and Shay find their lives once again intertwined as Debbie takes us on a journey of second chances, happy outcomes and hope for individuals which is a part of this magical season. Debbie does an excellent job with creating characters whom are easy to relate to and work their ways into our hearts. Check out more great reads from Debbie Mason! 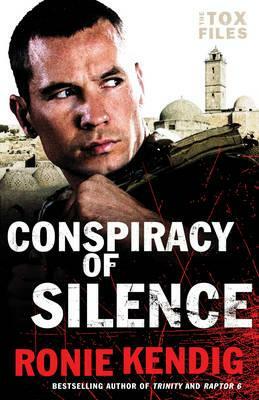 "Conspiracy of Silence" releases today! Four years after a tragic mission decimated his career and his team, Cole "Tox" Russell is persona non grata to the United States. And that's fine--he just wants to be left alone. But when a dormant, centuries-old disease is unleashed, Tox is lured back into action. "Conspiracy of Silence" is book #1 in Ronie Kendig's brand-new Tox Files series! This is fast-paced and filled with twists and turns from the start to the end. This book is an absolute engaging read that combines so many elements including Biblical history, suspense, politics, military, and non-stop action! Tox is dragged back into the action with FBI Agent Kasey and they are thrust in the midst of drama and suspense as they are forced to travel the globe to find a cure and uncover the layers that have been concealed for so long. Ronie writes in such a style that the reader is immediately drawn into the characters' world and smack dab into the action. Tox and Kasey are an amazing team and main characters and I am now anxiously awaiting for book #2! I highly encourage you to read the prequel novella that gives the background to Tox, "The Warrior's Seal" as you will give a better picture of Tox and who he is. Besides, Ronie's writing is that good, you do not want to miss out on any of it! Travel back in time to Civil War-era Chattanooga in @CynthiaLSimmons' new book, "Pursuing Gold"! I have always enjoyed reading books set during the Civil War era, so I was excited to read Cynthia's debut novel, "Pursuing Gold." Peter and Mary Beth are forced to take over ownership and running the bank when their fathers are no longer able to. However, this is not an easy feat during this time period. When some forged bills are discovered, running the bank becomes so much more difficult. There are problems that are building and tensions are mounting and these two individuals are facing danger as well. I enjoyed this book, it took a little bit for me to get into the story and the setting, but after a few chapters I did not want to stop reading as I just wanted to know what was going to happen with the forgery situation, but also between Peter and Mary Beth and their relationship. This is a great choice for those whom enjoy historical fiction and I am looking forward to see what Cynthia will write next.